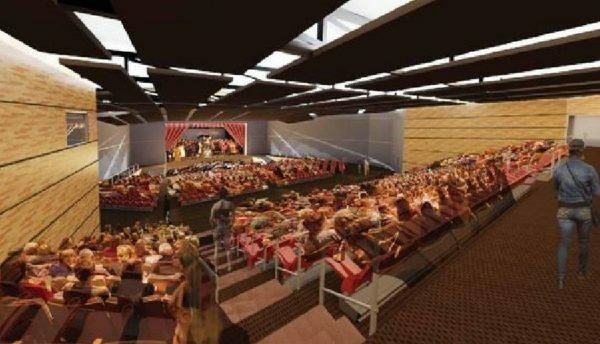 These conceptual images of what a new Sanford High School and associated performing arts center will look like have been posted as part of a slideshow on the Sanford School Department website. The current view of a construction site near Lewiston High School isn’t easy on the eyes. A dust bowl of grit and gravel stretching nearly 30 acres across the campus, and the athletic fields behind it. But school leaders say the future has never been brighter. “We think that this will be a jewel for the city,” said School Building Committee Chairman Thomas Shannon. Lewiston’s $50 million project will soon be the home of 900 elementary students, all within an arm’s reach of their high school counterparts. It will take on the students from Longwell and Martel Elementary schools, and begin a new era of education for those in Lewiston in 2019. “Lewiston has a lot to be proud of, and this school is going to be one of those things to brag about,” Shannon said. In Sanford, the walls are up on the most expensive school project in state history. Residents will cover 10 percent of the $103 million budget; the state will take the rest. The structure itself is an estimated 30,000 square feet, set to house about 1,800 students from both vocational and academic concentrations. “We’re taking what would be a typical high school, and a typical vocational school, and we’re mixing it up,” Theoharides said. The estimated completion date is the start of the 2018 school year. There are a few other schools under construction, with estimated completion dates for next year. According to the Portland School District, Fred P. Hall Elementary School should open during the 2018-19 school year. The budget is just under $30 million. The Kennebunk High School rebuilding project is set to cost $42.8 million. Classes have continued through construction, but it’s set to be completed sometime in fall of 2018.